Featuring ultra quiet, energy-efficient performance and increased safety, the Fellowes Fortishred 2250M Micro-Cut Paper Shredder is perfect for your shared office. 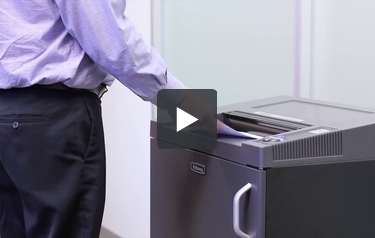 Designated a Security Level P-5 shredder (TAA Compliant), the 2250M destroys 10 sheets of sensitive material per pass and can handle credit cards, paper clips, and staples as well. Equipped with a 20-gallon removable basket for easy shred disposal, the 2250M is designed for continuous use and 3-5 users. Each unit comes with a 2-year warranty. Product number 4616601. Cut Size: 2/32" x 9/16"
Dimensions (HxWxD): 34.25" x 19.7" x 15"
I purchased this for my home office and it has functioned beautifully. Would have been 5 stars but I cannot get quite the number of pages in at a time that I expected. The shipping crate was very large, but the unit arrived on time and in good condition. Fellowes TAA Compliant products bring German made quality and innovation to the government market with our Fortishred line of cross-cut, strip-cut, and micro-cut shredders. These models offer continuous run time, large throat width, and the ability to shred more than just paper. The 4850 Series is ideal for 10 or more users and features a 15.75? throat and 44 Gallon removable waste bin. The 4250 Series is ideal for 10 or more users and features a 12? throat and 32 Gallon removable waste bin. The 3850 Series is ideal for 6 to 10 users and features a 15.75? throat and 44 Gallon removal waste bin. The 3250 Series is ideal for 6 to 10 users and features a 10.25? throat and 26.5 Gallon removable waste bin. The 2250 Series is ideal for 3 to 5 users and features a 10.25? throat and 20 Gallon removable waste bin. With Fortishred, paper jams are no longer a frustration. The sheet capacity sensor is available on the 3250 Series through the 4850 Series and helps prevent paper jams by indicating sheet capacity levels during the shredding process. While the 2250 Series as auto reverse which reverses paper if a jam occurs. The Fortishred line also features an electronically controlled safety shield that stops the shredder when opened. This line also features SilentShred Performance for ultra quiet operation, and Auto Shut Off which automatically shuts the shredder down after 30 minutes of inactivity. Experience innovation, power, and durability with Fellowes, the world?s toughest shredders. Throat Width 10.25" 12" 9.5"
Unit Dimensions (H x W x D) 34.25" x 19.7" x 15" 40" x 21.5" x 23.25" 27.6" x 15.6" x 11.6"